You don't need an excuse for casual summer get-togethers, but the festive aura of the Fourth of July practically demands a celebration. Whether you're hosting a BBQ at one of our Springs grilling stations or heading out to a friend's home, these recipes will create fireworks at any gathering. Tacos are a perfect summer food, easy to make and full of flavor. Quinoa adds a modern, healthy twist to the classic BBQ shredded pork filling. Top with chunky avocado salsa and zesty red onions. When it comes to hot dogs on the Fourth of July, everyone's a kid. These sparkler-inspired dogs are fun to make, look at and eat. Potato chips, peanuts and other crunchy snacks are a staple of Fourth of July entertaining. Barbecue roasted chickpeas are a nice change if you're cutting back on carbs or you just want to try something new. Don't be surprised if you end up with a new favorite snack! With white Cheddar as its main ingredient, this zesty dip is right on trend. Serve with regular and blue corn tortilla chips along with red pepper strips to make this dish extra holiday-friendly. Buffalo sauce isn't just for chicken wings. In this dish, cocktail-size hot dogs or smoked sausages get the Buffalo treatment, complete with blue cheese. Serve in slider buns and top with crushed blue corn chips. This cheesy side dish is a good low-carb alternative to garlic bread. Prepare on a grill or in the oven under the broiler. These baked beans have an amazing depth of flavor, but they couldn't be easier to make. Add bacon, brown sugar and cola to canned baked beans and put them in an oven or slow cooker. The recipe can remain your secret. Corn is a go-to food for any Fourth of July party. Instead of corn on the cob, try this savory relish that makes a delicious topping or side dish. Add some global flair to your Fourth of July celebration with this Italian favorite dressed up in all-American colors. It looks like it came from a pastry chef, but there's no baking involved. Just assemble the ingredients and refrigerate overnight. The tops of these colorful cupcakes combine the holiday theme with the look of snow cones, a favorite summer treat. Enlist the kids to help decorate, but keep an eye out for sneaky frosting thieves. Toast the holiday with these beautiful layered Margaritas that are almost too pretty to drink. Simply add frozen strawberries, frozen blueberries and coconut milk to a basic frozen Margarita mixture to create the colors. If you prefer, use traditional lime for the "white" layer. 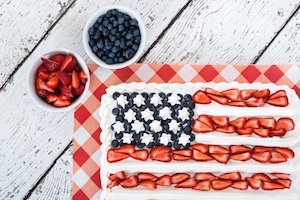 Share your favorite Fourth of July tradition in the comments!